Hendriks Greenhouses is a family-run ornamentals grower near Niagara Falls, Ontario. Helen and Andrew Sr. founded the farm and original greenhouse in 1953, where they grew tomatoes. In 1967, the farm began to shift its focus from vegetables towards flowers. Today Hendriks Greenhouses is known in the floral industry for their innovative, high-quality Indoor Gardens and beautiful kalanchoes. Their 240,000 square feet of greenhouses fulfill orders for up to 10,000 units each day. To maintain their edge in the ultra-competitive floral industry, Hendriks Greenhouses innovates constantly. When Head Grower Belal El-Hassan noticed that many of the top growers in Europe were using LED Grow Lights, he began to research the technology. During his research, he discovered LumiGrow through Freeman Herbs, who sang the dynamic LED fixture’s high praises. 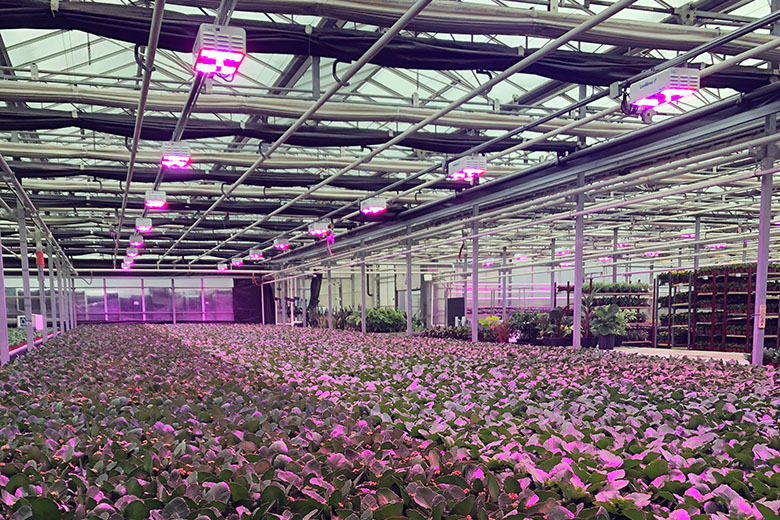 Freeman Herbs’ Head Grower Marco de Leonardis has been using LumiGrow fixtures’ targeted light spectrum to improve basil flavor and produce more compact potted herbs since 2016. Belal became particularly excited about using spectrum to direct the physiology of his ornamental plants. Hendriks Greenhouses installed LumiGrow LED fixtures with the LumiGrow smartPARTM Wireless Control System to adjust their fixtures’ spectrum in their Research and Development bays. Alexandra Farkas, their Project Manager of Research and Development, has been carefully designing experiments to maximize energy efficiency and use spectrum to direct desirable plant characteristics in several kalanchoe varieties. The experiment’s goal was to achieve a 15-week winter growth cycle for their kalanchoe. Alexandra hypothesized that the higher light output of LumiGrow fixtures would allow them to move plants from the long-day vegetative growth phase to the short-day flowering phase more quickly. The quicker turn time would free up more bench space for the next crop, increasing revenue. Based on Freeman Herbs’ experience, Alexandra also expected to see more uniform growth. Each of the experiment’s three varieties experiences different growing challenges during the winter; ‘African June’ responds to low light conditions by stretching toward the light source, while ‘Liva’ responds to limited light by staying short. Alexandra was optimistic that the LumiGrow LED fixtures could even out their natural shortcomings. Since kalanchoe are short-day plants, they require a photoperiod of less than 12 hours to flower. Alexandra worked closely with LumiGrow Research to create custom spectral programs for each phase of the plant’s growth. Together they designed a ‘Rooting’ program with a low blue-to-red ratio, a ‘Long Day’ program for vegetative growth and a ‘Short Day’ program to promote flower formation, each with increasing ratios of blue-to-red light. At the end of the experiment, all of the LumiGrow-lit plants had deeper flower and leaf coloration, as well as 20% more root growth compared to HPS. The plants also bloomed faster under the LumiGrow fixtures. The ‘African June’ grown under LumiGrow fixtures had 10% more flowers and were 6.5% more compact than those grown under HPS. The LumiGrow-lit ‘African June’ also required 2 less plant growth regulator (PGR) applications. In addition to saving money by using fewer chemicals, this saved Hendriks Greenhouses on labor. 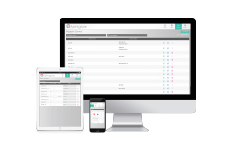 Each PGR application takes 15 minutes per table, and entry to the greenhouse is restricted for up to 24 hours, disrupting the greenhouse’s daily operation. Alexandra was pleased to see that the ‘Liva’ kalanchoes also responded positively to being grown under LumiGrow LEDs- they were over 5% taller than the same plants grown under HPS. ‘Liva’ grown under HPS are often too short, which is unappealing to consumers. While the HPS-grown plants caught up with their LED-grown counterparts during the last 10 weeks of growth and finished growing in the same amount of time, Alexandra suspects that this was due to the length of natural daylight growing longer as the trial progressed. Alexandra is excited to repeat the trial with new varieties this winter and plans on starting the plants earlier so that the flowering phase coincides with the shortest, darkest days of the year. Alexandra also looks forward to doing longevity trials to compare the LED-grown plants’ shelf life compared to their HPS-grown counterparts. LumiGrow Research found that cut flowers grown under LEDs had longer average vase life than flowers grown under HPS. Alexandra expects that potted kalanchoes will show similar results.